I’ve written quite a few posts about the paradox of ethanol; the idea that it appears a seemingly powerful alternative fuel, but one that comes with significant knock-on impacts to the global food supply. However, I am no expert, so I decided to track one down for an interview to learn more. Tim Haab is an environmental economist at Ohio State University who’s been spending a lot of time digging into the ethanol issue and came up with the term “Ethanol Dominos” to describe the trickle down effects of ethanol policy on food markets. Tim also runs a website Environmental Economics where he explains the economics of environmental issues. 1. Briefly describe what you do? I am an environmental economist at Ohio State University. That means I apply economic reasoning and models to environmental issues. Much of my work focuses on the valuation (placing dollar values) of environmental good and services when markets fail to do so. But I also have interests in the analysis of government policies that impact the environment. One of my professional goals is to help non-economists understand how economists think about environmental issues. To that end, we (John Whitehead and myself) started a web-site call Environmental Economics where we attempt to use our limited expertise and even more limited senses of humor to explain the economics of environmental issues to non-economists. 2. 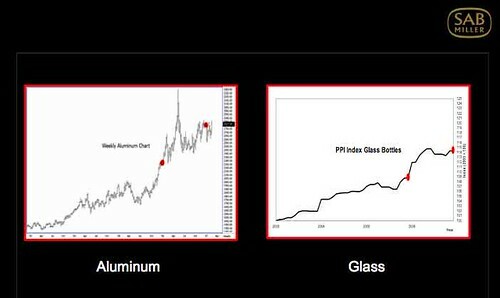 What has been the catalyst for the increased interest in ethanol, when exactly was the inflection point? In my view, much of the catalyst has been the increased attention climate change has received lately coupled with a strong farm lobby in the U.S. Increased attention on climate change immediately focuses attention on energy consumption and particularly fossil fuels. As fossil fuel prices rise in response to political situations and natural scarcity, two things are expected to occur: 1) increased conservation of fossil fuels–decreased consumption due to higher prices and 2) increased investment in alternative energy sources. 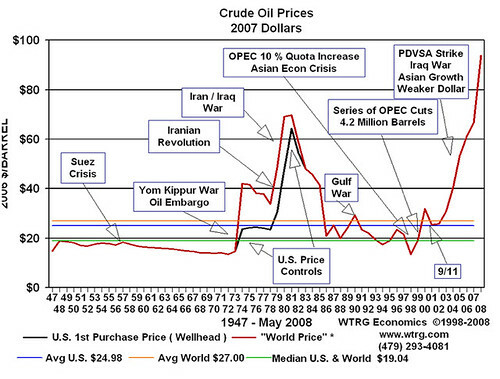 Fossil fuels are used extensively because they are inexpensive and the infrastructure is in place. Economic models show us that the natural course of reaction to higher fossil fuel prices would be to turn to the next cheapest alternative. Unfortunately, things aren’t always quite that simple. It’s not always easy to identify what that next alternative will be. Some think it will be wind energy, some thing it will be hydrogen, some think it will be nuclear, but many think ethanol is the next step. That seems to be where U.S. policy makers stand. 3. What’s happening in US agriculture to try and meet the demand. How radical is this transformation? Interesting question, for which we don’t yet have all of the data to fully answer it. So for now we rely on anecdotal evidence that transformations are taking place. Since, in the U.S., almost all ethanol is corn based ethanol, as the demand for ethanol increases, the demand for corn increases. As the demand for any product increase, it’s price rises. So the immediate impact of an increase in the demand for corn is an increase in corn prices. Over a number of growing seasons, we would expect to see these higher corn prices result in increased plantings of corn as opposed to other land intensive crops (particularly soy and other grains). The resulting decreased supply in soy and grain would result in higher soy and grain prices. How radical of a transformation takes place depends on how much emphasis is placed on ethanol by consumers and on the levels of subsidies for ethanol production in future U.S. energy and farm bills. 4. What are Ethanol Dominos? As I started to describe above, Ethanol Dominoes are the trickle down effects that ethanol policy creates through food and energy markets. Many times, policies are designed to directly affect a particular market and either through willful ignorance or intentional planning the effects on other markets are ignored. Unfortunately, individual markets in market-based economies don’t work in isolation. So in the ethanol case, a U.S. policy requiring 15% ethanol production can have dramatic effects downstream. Over the past year we have seen corn prices double (to roughly $4 a bushel). The increased demand for corn to meet government mandated ethanol goals will raise the price of everything produced from corn. 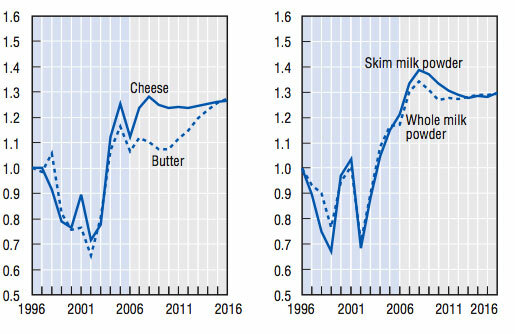 Following one chain of dominoes we might see that increased corn prices increase the cost of feeding cattle (who eat corn) which increases the cost of milk production which increases the price of milk (which is now as high as $4 per gallon in many places) which increases the cost of milk related products like ice cream and dairy creamers. To whit, Starbucks recently announced an across the board increase in coffee drinks requiring milk products due to increased milk prices. In addition to other factors, that price increase can be traced back to bad ethanol policy. While increased Starbucks prices may seem like a superficial concern when compared with the environmental and national security concerns from fossil fuel consumption, increased corn prices can have other dramatic effects if we follow other domino chains. Increased demand for corn will raise corn prices, which raises the price of producing corn related products such as corn tortillas. Rural Mexicans rely on corn tortillas as their primary source of protein (as much as 40% of their protein comes from tortillas). The U.S. emphasis on corn-based ethanol has driven tortilla prices up to the point that a poor family of four has trouble purchasing a day’s worth of tortillas on a day’s wages. So what is the reaction of the Mexican government? 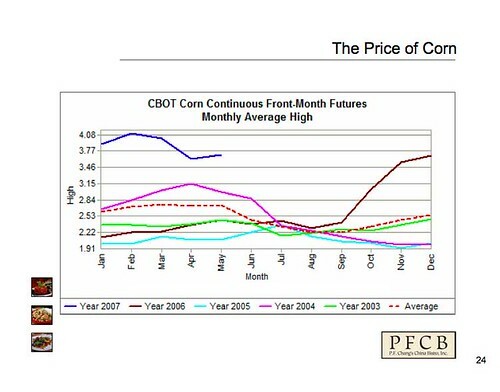 Consideration of a price cap on corn. A bad reactionary policy to counteract the effects of U.S. ethanol policy. 5. Is the era of cheap food now officially over? I’d like to think that I had official power to make that call, but frankly I don’t know. Food in the U.S. is cheap and it’s one of the reasons that the government can get away with energy and farm policies that are economically inefficient but politically palatable. The end result to the U.S. consumer of ethanol policy might be a minimal increase in overall grocery bills. While the effect is minimal for each household, if we add up the total costs to society, the effects can be substantial. But as long as the cost to the household is small, there won’t be a groundswell of opposition to inefficient policies.